Microsoft has the Windows Hello feature that allows users to unlock their devices with their face with the help of facial recognition. Apple is behind when it comes to such technology. It is possible that the next MacBooks will have this kind of feature. We have found an Apple Presence Sensing patent that shows something similar to Windows Hello. Apple Presence Sensing patent shows that the Macbooks will unlock when the device detects that the user in the specified space. This could be done with either facial recognition or with a retina scanner. We have also heard about the upcoming iPhone ditching the fingerprint reader for a retina scanner. It would make sense seeing how the scanner would not look good at the back. Reports also claim that the technology needed to hide the fingerprint scanner under the screen will not make it in time for the iPhone 8 release. Having said that, it would make sense for the next iPhone as well as the MacBooks to feature Apple Presence Sensing. 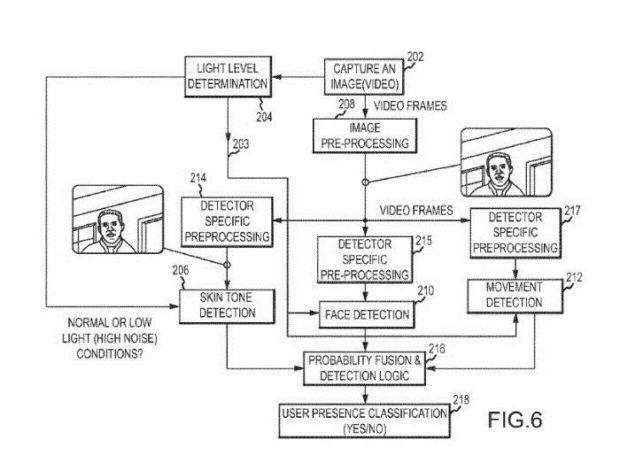 It will be interesting to see how this Apple Presence Sensing patent will translate to actual hardware and application. Knowing Apple I expect to see a seamless facial recognition unlock feature in the next series of Macbooks. It would be cool if the company could somehow make this work on previous versions of the MacBooks as well but that’s a long shot. Apple products are great and are built well but when it comes to staying with the times it seems that Apple has fallen behind. With the 10th anniversary of the iPhone coming up people are expecting something big from Apple and I wonder if Apple can meet the expectations of the people. Let us know what you think about this Apple Presence Sensing patent and whether or not this is something that you are looking forward to using.